Jill Osier’s Should Our Undoing Come Down Upon Us White, winner of the 2013 Frost Place Chapbook Competition, is now available for pre-order. And if you weren’t already excited, we’re having a pre-order sale: order your copy before the release date, and you’ll get it for only $10.00 plus shipping. Osier’s work has been awarded a Literature Fellowship from the National Endowment for the Arts, the Diane Middlebrook Poetry Fellowship from the Wisconsin Institute for Creative Writing, and the Campbell Corner Poetry Prize. Selected by judge Patrick Donnelly, author of The Charge and Nocturnes of the Brothel of Ruin, Osier’s chapbook explores the landscape of winter and how we struggle for human connection when the elements bear down on us. As the Frost Place Chapbook Competition winner, Osier will receive a fellowship to the Frost Place Poetry Seminar in Franconia, NH, this August, give readings at The Frost Place, and live and write in Frost’s mountain cabin for a week this fall. Participants of the seminar will have a chance to buy advance copies. Osier’s readings will be August 7 at 8:00 p.m. at the Frost Place barn (with Frost Place poet-in-residence Nicole Terez Dutton, author of If One of Us Should Fall) and August 19 at the Frost Place gala. Should Our Undoing Come Down Upon Us White will ship September 3, 2013. Pre-order your copy at our discounted price by following this link. Anne Keefe‘s debut collection Lithopedia, winner of the 2010 Bull City Press First Book Prize, is now available for preorder! Until November 6th, we’re offering a special price of $12.95 plus free shipping in the US. If you’re in North Carolina, you can come celebrate the launch of Lithopedia and of Another & Another: An Anthology from the Grind Daily Writing Series, in partnership with the Hinge Literary Center and the Carrack Modern Art, in our hometown of Durham! Featuring a reading by Anne Keefe, and Grind anthology contributors Richard D. Allen, Angela Kirby, Matthew Olzmann, Matthew Poindexter, Rachel Berry Surles, and Ross White. Join us Friday, November 9, at 7:00 PM at The Carrack Modern Art. Seating is limited, so arrive on time! And if you’d like, you can RSVP on Facebook. Congratulations to W. Vandoren Wheeler for winning this year’s Dorothy Brunsman Poetry Prize for his debut book of poetry, The Accidentalist! This collection is now available for order from Bear Star Press and Small Press Distribution. You can find work by Vandoren and by over forty other talented poets in our anthology Another and Another: An Anthology from the Grind Daily Writing Series. Our summer issue has arrived, right at the end of summer, and longtime readers may think, “Hmm, something fishy is going on here!” To celebrate our sixth year in print, our friends at Flying Hand Studio have given Inch a brand new design. Ready to get your mitts on a copy? Head this way. Copies are still only a buck. Congratulations to Inch 9 contributor Christopher Meades who has just released a novel, The Last Hiccup, with ECW Press. 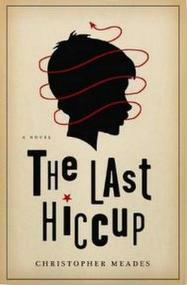 A darkly funny, tragic, and ultimately heroic novel set in 1930s Russia, The Last Hiccup is the story of Vladimir, an eight-year-old boy stricken with a case of the hiccups that lasts over a decade. Put through a series of extraordinary, often bizarre treatments by a famous physician, Sergei Namestikov, Vlad is spirited away from his rural home and doting mother to a hospital in Moscow. But Sergei’s chief medical rival, the brilliant Alexander Afiniganov, believes that beneath Vladimir’s mirror-less eyes lurks a pure, unbridled evil, and Vlad is removed from polite society. Isolated from everyone and everything — save his hiccups — Vladimir grows up to find inner peace among the hiccupping. On his way back into the world he once knew, through a country now in the midst of war, he encounters many strange people and situations, always wondering what would happen to him should a cure for his now-comforting affliction be found. You can read an excerpt of The Last Hiccup on Meandes’ website and purchase a signed copy (!) of the novel through Paypal here. Our summer 2009 issue of Inch is now available for sale. If this lineup doesn’t tempt you, it’s very possible that nothing in the world can tempt you. Inch #11 marks the farewell issue for fiction editor Bill Ferris, who co-founded the magazine back in the summer of 2006. Without Bill’s support and encouragement, there would be no Bull City Press, and we will never be able to thank him enough. It’s been a busy day at the Bull City warehouse, where we’ve been working on the web site and unearthing some additional back issues. Our big news is that Katie Bowler’s State Street, a poem about post-Katrina New Orleans, is now available for pre-order exclusively on the Bull City Press web site. We’ll eventually have the book available on Amazon and in local bookstores, but if you want to guarantee that you get your copy early, you’ll have to visit Bull City! Additionally, copies of Inch #5 and #7, which we previously thought were sold out, are now available again over at the Inch site. We discovered a stack of copies from the first printing that had been printed but never stapled. Just a few of each exist, so get them while you can. We’ve been having some problems with our website which we hope to get fixed over the weekend, but we couldn’t wait to tell you that Inch #10 is now available! This issue features poetry by Addie Tsai, Mary Leader, Christopher Citro, Muriel Nelson, and Michael Walsh, and a story by Kevin Grauke. It’s bite-sized literature at its best. We’ll have the website fixed as soon as possible, and we’ll have our current issue for sale along with a selection of back issues that were recently unearthed in the warehouse. Check back soon.